Credit card debt among 18-29 year-olds has declined by about a third between 2007 and 2012. In addition, a Channel One News study conducted by MAi in 2010-2011 showed that 66 percent of teens have opened their own savings account. Almost every way you look at it, saving instead of spending is IN. But how do you get on board with this growing trend? We’re here to help with some advice on making saving money a habit instead of a hindrance. And we’ve got some good news — there are ways you can make the money you set aside turn into more money with a little thing called interest. 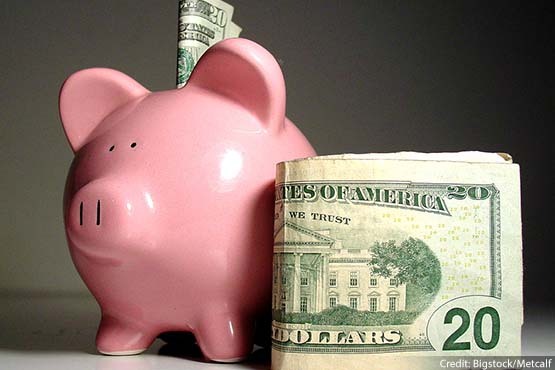 Let’s get started by looking at some of the best and most common ways to save. Almost every consumer bank offers a straightforward savings account where you can regularly make deposits and withdrawals. These basic accounts offer flexibility, but not a very high interest rate, so you won’t be earning much on the money you have in an account like this. If you don’t need to touch the money in your savings account more than a few times a month (and it’s a savings account, so you shouldn’t be) a money market savings account might be a better option. You’ll earn more in interest, and the rules about these accounts discourage you from pulling money out unless it’s a true emergency. Most banks also offer something called a Certificate of Deposit, or “CD.” These accounts offer even higher interest rates, but require you to leave the money alone for a specified amount of time — meaning, you can’t withdraw (or spend!) any of it without incurring a penalty until the term of your CD is up. CDs can be a good option for savings if you’re someone who has a difficult time putting away money or if you won’t need to spend the money until a specific time in the future, for example, within a few years to cover college tuition. Something to remember about the basic savings products offered by most banks is that probably they’re Federal Deposit Insurance Corporation (FDIC) insured, meaning that even if something crazy happens in the banking system, like it did a few years ago, your money will be safe and sound. Always make sure your bank is federally insured before putting money into it. Investments are designed for people who have some time to let money grow and want to try to make a little more return on the money they’re saving, and (this is the important part) are willing to take some risk with those hard-earned dollars. You could make an investment, even in something relatively “safe,” and still end up losing some of your money, but that’s one of the reasons that wise investments are usually long-term — more than five years — so that even if your investment loses some value, there’s time to make that back up. If you decide that you’re willing to take some risk with your money, you could come out further ahead than you might think. If you’re thinking long-term, investment earnings can be significantly greater than the return on a bank account. Now that you know what the options are for good places to stash your cash, you’re probably wondering where all this seed money is going to come from. We have some suggestions for that too! The first step is to figure out where your money is coming from and where it’s going. If you don’t have a job, you might get an allowance from your parents for helping out around the house or you might have money you’ve received from birthdays or holidays. If that’s the case, you probably also live with your parents, meaning your expenses are low. Why not put away 25 percent of what they give you or what you receive? If you’ve got a regular way to make money, like babysitting, lawn care or any other entrepreneurial venture, you can try to save about the same amount of that too. If you have a more ‘official’ job, where you get a regular check, consider setting up an automatic deduction for savings. If you never see the money you’re setting aside, it’s much more difficult to spend it. And when you find out how satisfying it can be to watch your bank balance tick up, it can be fun to challenge yourself to save even more. Finally, no matter how you make money, creating a budget and sticking to it will guarantee that you always have something to set aside for savings. If you get into the habit of being a savvy saver as a teen, you’ll be able to do the things you really want to do with your money — which is a much better feeling than just being trendy. I want to save money for a car or maybe even collage…. What if your 13 and u want to work but u can’t because your parents say your to young? Thanks needed these ideas! VLN Partners PA you can hang up flyers to babysit or if you have good grades you can help other students. You should see if your school allows you to sell candy or snacks, that’s a good way to earn a few dollars. Also if you live in a state that pays for recycling, save your family’s bottles and cans to turn in for cash. Hope this helps! what if you want to baby sit but your parents don’t want you to ask people you don’t know? ok I love this episode because it was so interesting. And I just saw a cermrercial of smokey the bear, today is smokeys birthday! Well YAyZIEZ HAPPPPPPY BIRTHADAY!